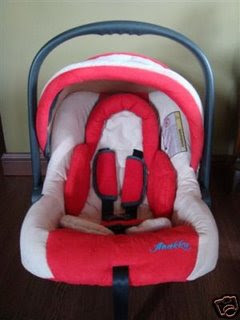 I bought this Anakku infant carrier car seat from Ebay.com.my as mentioned in my earlier post. Shern has been sitting in it for more than 3 months almost daily every time we traveled by car - to & fro mum's place and our home, hospitals, government clinics, to Ah-Ma's hse, etc. 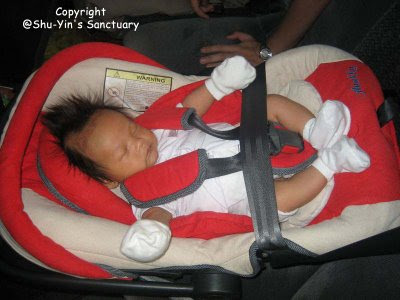 I find this infant carrier car seat not 'that safe' because it does not have a base. It is easy to strap to the car using our seat belts but you really need to know how to tighten it to a sense that the car seat do not wobble during the ride. The cumbersome part is that you can only strap it after you have strapped the baby in. And if you want to carry your baby out, you need to unstrap it first before you can release the baby's harness belt. Which means you need to 'install' the car seat to the car EVERY TIME you seat the baby inside it. That's the problem when the car seat do not have a base. 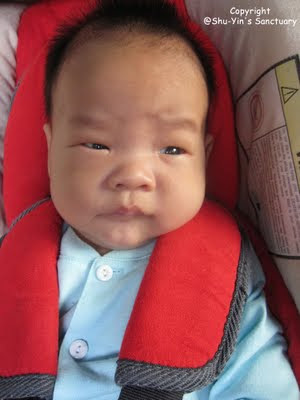 The 3-point harness belt also makes me feel not so comfortable knowing that 5-point harness is the safest for baby. But I still use it every time Shern travels with us in the car (unless he starts screaming and I need to unstrap him to carry him out). I want Shern to get used to sitting inside the car seat. You need to start them young. If not, they will refuse to be seated there when they are bigger. im thinking to buy the same, coz my car is quiet small(VW beetle cabrio)at the moment.i dont think this car seat is that BAD, rite?? Yes, it is not that bad actually...just that there are better ones in the market. My baby is still sitting in it (he is 4 mths+ now) every day. If it that bad, i wouldnt let him sit, right? anyway, he seems very comfy in that seat. i love the shoulder strap by the way.